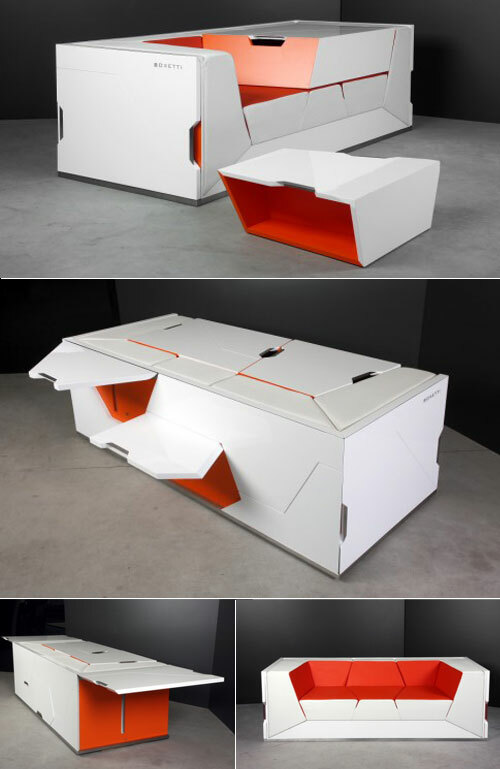 Boxetti collection is one of the most fancy furniture designs I’ve ever seen. It is driven by three basic design principles – functionality, advanced technologies and contemporary aesthetics of minimalism. Each of Boxetti modules is designed to achieve maximum efficiency of particular demands for functionality and suitability. The capability of the modules to be transformed into compactly solid blocks is essential for the design concept in order to obtain an unobstructed and comfortable space – free of uselessness. Boxetti Private contains the set of basic bedroom functions –a double bed, night stand and a wardrobe. 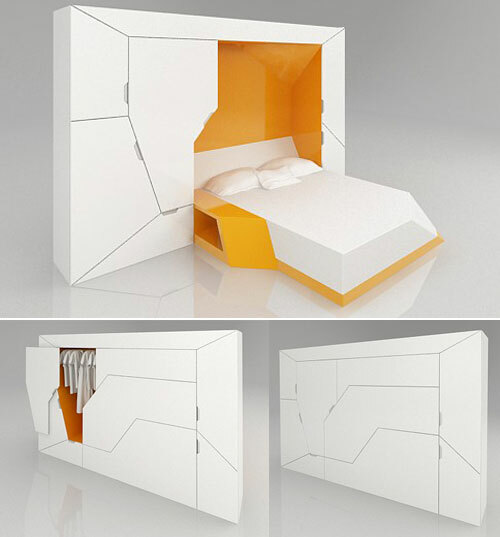 The foldaway bed platform is automatically lifted by a remote control, together with a built-in night stand. The unit is equipped with a spotlight and an ambience lighting fixture above the headboard. 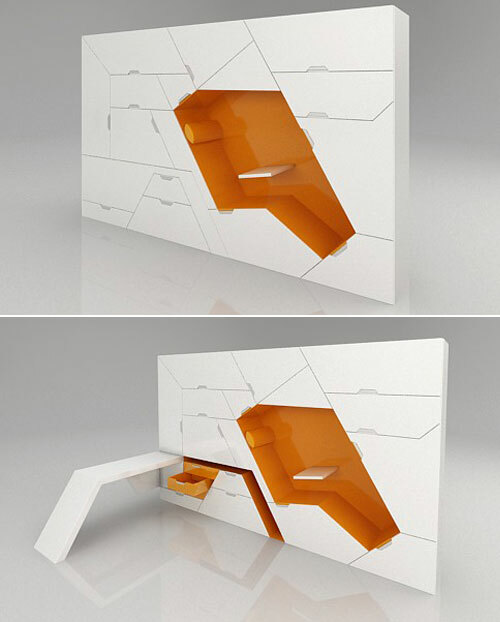 The integrated wardrobe consists of six sections including shelves, drawers and a clothes rail. BOXETTI_PRACTICE has a manual foldaway desk top with a block of drawers, a bookshelves system and a upholstered chill-out niche for a more relaxed practice, equipped with a smaller adjustable desk top. 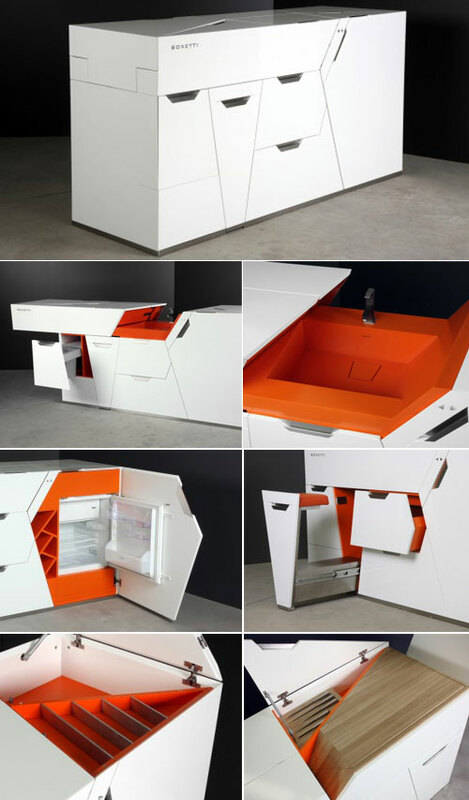 Boxetti Lunch is a multifunctional kitchen island unit containing all the necessary kitchen equipment. The unit has an automatic sliding surface uncovering a built-in sink with a tap. The work surface contains a closed space for tableware together with a default set of kitchen knifes. The part of the top surface is foldable to uncover the oak tree cutting board, the foldable cover has a built-in LED spotlight. 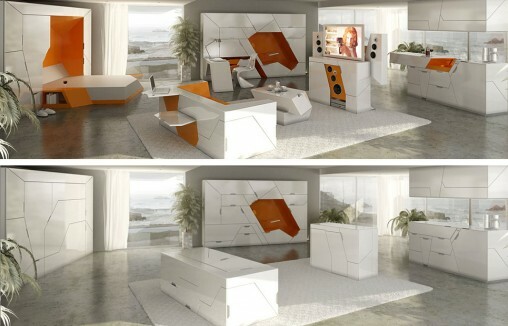 The unit is equipped with two extensible bar seats, a space for built-in fridge, a standard set of shelves and drawers. 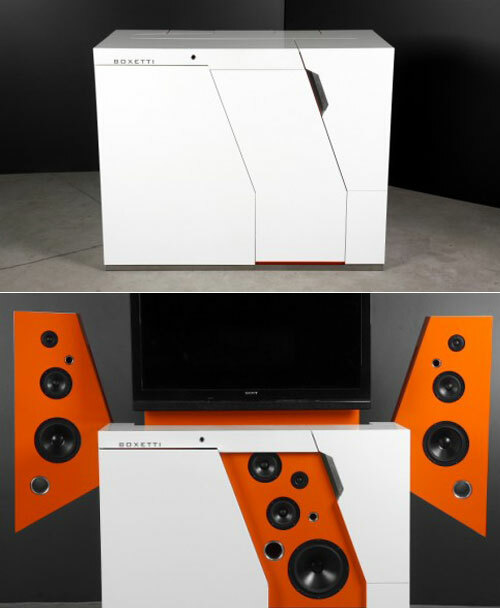 Boxetti Thrill is a set of TV and a built-in hi-fi audio system. The remote control automatically transforms the compacted unit into a stunning design object providing a high quality sound and vision performance. Boxetti Thrill contains a built-in sound system and an automatic HAFELE lift system for a flat TV screen up to 46”, High Standart 7.1ch RECEIVER and a Basic BluRay Player. The unit contains a closed section for a DVD collection. Boxetti Lounge contains the set of integrated furniture for a living space – a unit of three-seat couch with removable blocks of occasional tables. The compacted module can be used as a freestanding table surface. The unit has a foldable side panels to extend the top surface. The couch is upholstered and can be finished with leather or fabric up to demand. The unit is equipped with a small additional workspace consisting of foldable desk top and a seat surface behind the couch. I have to say, those “box” are pretty pricey. But if you are interested in them, you can check the detail on its website.